February 20th 2017. CAC Global Citizen Taylor Allen writes about her experience working with CAC and FESAC in Hermosillo, Sonora, Mexico. The Coaches Across Continents team landed in Hermosillo, Sonora, Mexico at 11:30pm after four two-hour flights. While a bit exhausted we were greeted by a bubbly character by the name of Andrea from the local partner, Fundación del Empresario Sonorense (FESAC). She hit us with a burst of energy that quickly permeated our sleepiness. This is an energy that we would continue to experience with the participants throughout the week! Hermosillo reminded me a lot of home in Southern California. Paved roads with some street vendors selling delicious tamales, tacos, and fresh fruits. The first day the partner took us to Náinari Lake. It was the place to be! Everyone was there. Vendors were selling food and drinks, there was a stage with live music, people were on pedal boats across the lake, zip lines longer than a football field were hanging above the lake, we saw birds being fed, trampolines being used, and countless children in battery operated cars driving around in front of their parents while they walked the perimeter of the lake. It was stunning. We were able to walk around and watch the sun set over the lake until it became too chilly. Then the partner took us back to our hotel. It was a nice break before getting the week started. 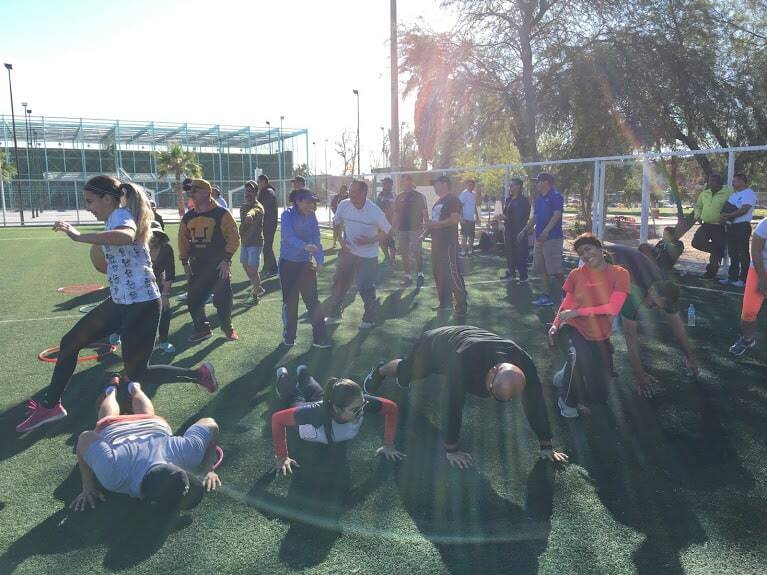 This week we worked with Physical Education teachers and students in the Hermosillo area. The teachers were eager to learn and get started. A lot of them remembered a couple of the games from last year and mentioned they used them throughout the year. We were told that one of the teachers even took the CAC curriculum they learned from last year to nearby after-school programs outside of Hermosillo. What an impact! It was so great to hear about the CAC curriculum making it’s way around Sonora, Mexico after teachers had gone through the training last year. This group was ready and engaged. As new games were being presented they had plenty of questions, conversations and creative solutions to current challenges facing their schools today. 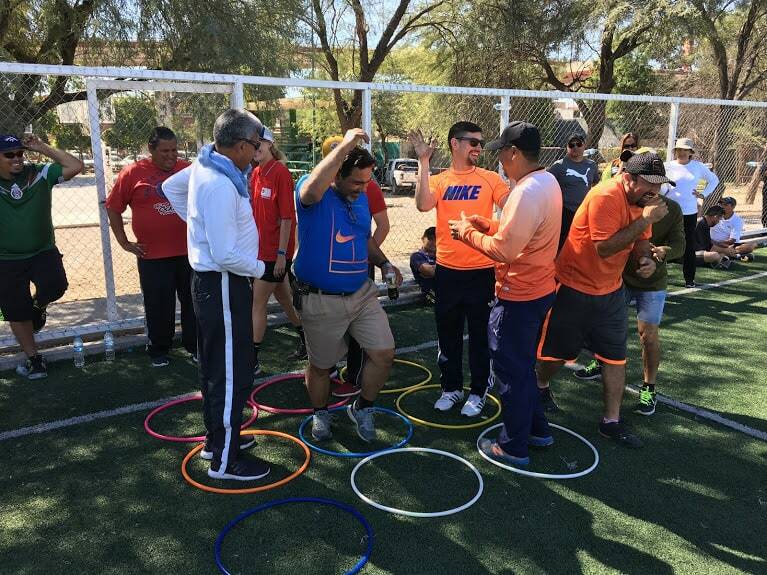 This group was so involved that they were able to adapt games on the spot when asked how they would change the game to make it even more relevant to what they face as Physical Education in schools in Sonora, Mexico. “My name is Dayanna Enriquez from Hermosillo, Sonora, Mexico. I attended the training sessions this past week. I currently study physical education and as a student, the sessions Mark, Taylor and Emily provided taught me so many things when it comes to teaching children. How simple games can impact the lives of so many kids and the way we as teachers can help them grow and accomplish many goals in life. The week was very productive with a lot of fun games and lessons learned. We had lots of fun and they actually inspired me to find out more about the organization Coaches Across Continents to see if there is any way for me to volunteer and try and help others make the world a better place. I want to thank Mark, Taylor and Emily for providing me with the opportunity to take part in the weekly sessions. Also I want to congratulate them for their enthusiasm and their great outgoing personalities that made this course lots of fun and a great atmosphere for us to learn while enjoying ourselves. Coaches Across Continents has created a space for teachers at different schools to come together and start a conversation around how they can overcome the biggest issues facing their kids today. The CAC curriculum has already sparked action within the teaching community in Hermosillo. After successfully taking on the challenge of creating their own games with social messaging attached, the teachers are motivated and determined to continue the work and adaptation of the CAC curriculum to address relevant issues in their communities. I look forward to seeing the growth of this group in the next few months! Great job CAC! My recognition and congratulation for this group called FESAC, and the PE teachers attending the CAC activities as an alternative way to teach our kids learning for life skills.